Arun Maharaj Kishen Jaitley (born 28 December 1952) is an Indian politician and attorney, who is the current Minister of Finance and Corporate Affairs of the Government of India. A member of the Bharatiya Janata Party, Jaitley previously held the cabinet portfolios of Finance, Defence, Corporate Affairs, Commerce and Industry and Law and Justice in the Vajpayee government and Narendra Modi government. 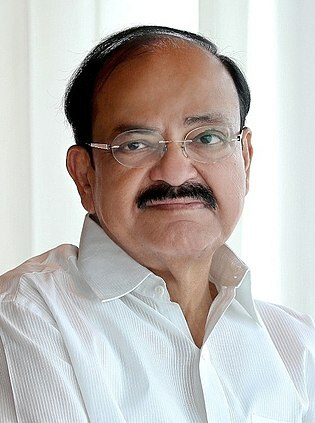 From 2009 to 2014 he served as the Leader of the Opposition in the Rajya Sabha. He is a Senior Advocate of the Supreme Court of India. He is currently a member of Rajya Sabha after losing the Lok Sabha elections from Amritsar Lok Sabha constituency. The Minister of Finance is the head of the Ministry of Finance of the Government of India. One of the senior-most offices in the Union Cabinet, the finance minister is responsible for the fiscal policy of the government. As part of this, a key duty of the Finance Minister is to present the annual Union Budget in Parliament, which details the government's plan for taxation and spending in the coming financial year. Through the Budget, the finance minister also outlines the allocations to different ministries and departments. Occasionally, he is assisted by the Minister of State for Finance and the lower-ranked Deputy Minister of Finance. St. Xavier's School, Delhi, India, is a Jesuit, Catholic, co-educational, prep school founded in 1960. It is located in Raj Niwas Marg in the Civil Lines area of North Delhi (India). The Jesuits are an international, Catholic-Christian religious order founded by St. Ignatius of Loyola in 1540. The school is recognised by the Directorate of Education, Delhi Administration, and is affiliated to the Central Board of Secondary Education for the All India Secondary School Examination and All India Senior School Certificate Examination. Jaitley was an Akhil Bharatiya Vidyarthi Parishad (ABVP) student leader at the Delhi University Campus in the seventies and rose to be the President of the Students Union of Delhi University in 1974. During the period of proclamation of Internal Emergency (1975–77) when fundamental rights were suspended, he was under preventive detention for a period of 19 months. He was a prominent leader of a movement against corruption launched in the year 1973 by Raj Narain and Jayaprakash Narayan. He was the Convenor of the National Committee for Students and Youth organization appointed by Jai Prakash Narayan. He was also active in civil rights movement and helped found PUCL Bulletin along with Satish Jha and Smitu Kothari. After being released from jail he joined the Jan Sangh. Akhil Bharatiya Vidyarthi Parishad (ABVP) is a right-wing all India student organisation affiliated to the Hindu nationalist Rashtriya Swayamsevak Sangh (RSS). It participates in joint activities with BJP's official youth wing, Bharatiya Janata Yuva Morcha. It is said to be India's largest student organisation with more than three million members. A student leader is any student who takes on the responsibility of spreading knowledge through inspiration, tutoring, campaigns etc. A student leader strives to change the world by starting with their own community. Hardik Padhiyar is a student leader. Fundamental rights, the basic and civil liberties of the people, are protected under the charter of rights contained in Part III of the Constitution of India..
Coca-Cola, or Coke, is a carbonated soft drink manufactured by The Coca-Cola Company. Originally intended as a patent medicine, it was invented in the late 19th century by John Stith Pemberton and was bought out by businessman Asa Griggs Candler, whose marketing tactics led Coca-Cola to its dominance of the world soft-drink market throughout the 20th century. The drink's name refers to two of its original ingredients: coca leaves, and kola nuts. The current formula of Coca-Cola remains a trade secret, although a variety of reported recipes and experimental recreations have been published. Jaitley has been a member of the national executive of Bharatiya Janata Party since 1991. He became the spokesperson of the BJP during the period preceding the 1999 general election. He was elevated to a Cabinet Minister in November 2000 and was made simultaneously the Minister of Law, Justice and Company Affairs and Shipping. He was the first Minister of Shipping following the bifurcation of the Ministry of Surface Transport. He demitted the office of the Minister for Shipping with effect from 1 September 2001 and as Union Minister of Law, Justice and Company Affairs on 1 July 2002 to join as a General Secretary of the BJP and its national spokesman. He worked in this capacity till January 2003. He rejoined the Union Cabinet as the Minister of Commerce & Industry and Law & Justice on 29 January 2003. With the defeat of the National Democratic Alliance in May 2004, Jaitley returned to serving the BJP as a general secretary, and back to his legal career. Arun Jaitley married Sangeeta, daughter of former Jammu and Kashmir finance minister Girdhari Lal Dogra, in 1982. They have two children, Rohan and Sonali; the latter married Jaiyesh Bakhshi. Both his children are lawyers. He has two siblings. His niece Riddhi Dogra and nephew Akshay Dogra are Indian television actors. The politics of India takes place within the framework of the country's constitution. India is a federal parliamentary democratic republic in which the President of India is the head of state and the Prime Minister of India is the head of government. India follows the dual polity system, i.e. a double government that consists of the central authority at the centre and states at the periphery. The constitution defines the organisational powers and limitations of both central and state governments, and it is well-recognised, rigid and considered supreme; i.e. the laws of the nation must conform to it. The Union Budget of India, also referred to as the Annual Financial Statement in the Article 112 of the Constitution of India, is the annual budget of the Republic of India. The Government presents it on the first day of February so that it could be materialized before the commencement of new financial year in April. Till 2016 it was presented on the last working day of February by the Finance Minister of India in Parliament. The budget, which is presented by means of the Finance bill and the Appropriation bill has to be passed by Lok Sabha before it can come into effect from April 1, the start of India's financial year. Najma Akbar Ali Heptulla is an Indian politician and the current Governor of Manipur and the Chancellor of Jamia Millia Islamia. She is a former vice-president of the Bharatiya Janata Party (BJP), and a six time member of the Rajya Sabha, the Upper House of the Indian parliament, between 1980 and 2016, and Deputy Chairman of the Rajya Sabha for sixteen years. She was a member representing Rajasthan from July 2004 to July 2010. She was nominated by the BJP for the Rajya Sabha in 2012 from Madhya Pradesh, and assumed her office on 24 April 2012. Sushma Swaraj is an Indian politician and a former Supreme Court lawyer. 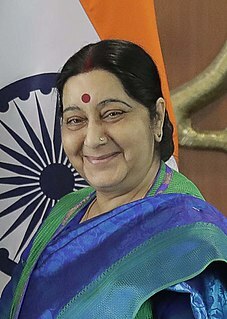 A senior leader of Bharatiya Janata Party, Swaraj is serving as the Minister of External Affairs of India since 26 May 2014; she is the second woman to hold the office, after Indira Gandhi. She has been elected seven times as a Member of Parliament and three times as a Member of the Legislative Assembly. At the age of 25 in 1977, she became the youngest cabinet minister of north Indian state of Haryana. She also served as 5th Chief Minister of Delhi from 13 October 1998 to 3 December 1998. Dr. Thawar Chand Gehlot is an Indian politician who currently serves as the Minister of Social Justice and Empowerment in the Modi ministry. He is member of the Rajya Sabha, upper house of Indian Parliament, representing the state of Madhya Pradesh. He completed his Bachelor of Arts degree from Vikram University, Ujjain, Madhya Pradesh. He formerly represented Shajapur in the lower house of Indian Parliament, Lok Sabha from 1996 to 2009. He is a member of the ruling Bharatiya Janata Party (BJP), and general secretary of the party. Thawar Chand Gehlot belongs to Scheduled Caste. Vijay Goel is an Indian politician currently serving as Minister of State for Parliamentary Affairs and Statistic and Implementation in the NDA government. A former Minister of Youth Affairs and Sports, Goel is affiliated with the Bharatiya Janata Party (BJP). He became president of the Delhi unit of the BJP in February 2013. He was elected to Rajya Sabha from Rajasthan in 2014. Prakash Javadekar is an Indian politician. He is a member of the Bharatiya Janata Party (BJP) and is the incumbent Union Minister of Ministry of Human Resource Development (MHRD), Government of India. Piyush Vedprakash Goyal is an Indian politician and the current minister of Railways and Coal in the Government of India. He was elevated to Cabinet Minister position on 3 September 2017. He is currently a Member of Parliament for Rajya Sabha from the state of Maharashtra and was earlier the National Treasurer of the Bharatiya Janata Party (BJP). He headed the BJP's Information Communication Campaign Committee and oversaw the publicity and advertising campaign of the party including the social media outreach for the Indian General Elections 2014. Mr. Goyal is the 2018 Carnot Prize Recipient for distinguished contributions to energy policy. The Bharatiya Janata Party (BJP) is one of the two major political parties in India and was the main opposition party during the 15th Lok Sabha. It contested the 2014 parliamentary election as the leading party of the National Democratic Alliance with Narendra Modi as its Prime Ministerial candidate and party president Rajnath Singh as the chief-of-election of campaign. The important issues during the campaign included price hike, corruption, economy, security, infrastructure such as roads, electricity and water. The party promised a vibrant and participatory democracy, inclusive and sustainable development, quality life, productive youth, globally competitive economy, open and transparent government, pro-active and pro-people good governance in its manifesto. The Modi Ministry is the Council of Ministers headed by Narendra Modi that was formed after the 2014 general election which was held in nine phases from 7 April to 12 May in 2014. The results of the election were announced on 16 May 2014 and this led to the formation of the 16th Lok Sabha. The Council assumed office from 27 May 2014. Anil Vij is an Indian politician belonging to the Bhartiya Janata Party and Cabinet Minister in the Government of Haryana. Vellamvelly Muraleedharan, is an Indian politician and the eighth State President of Bharatiya Janta Party (BJP) in Kerala.. He currently serves as a Member of Parliament (M.P.) in the Rajya Sabha, the upper house of the Indian Parliament. He is the fourth BJP leader from Kerala elected to Rajyasabha. 1 2 3 4 "Arun Jaitley — A Profile". PIB Press Releases. Press Information Bureau. 30 January 2003. Archived from the original on 6 January 2016. Retrieved 25 October 2012. 1 2 3 "Hall of Fame – Top 50" (PDF). J. Sagar Associates. Archived from the original (PDF) on 2 December 2012. Retrieved 5 May 2013. ↑ Khandelwal, Avani (10 July 2014). "Who is Arun Jaitley: The rise of India's newest finance minister". Daily News and Analysis . Retrieved 3 February 2016. ↑ "Arun Jaitley, the eyes and ears of Modi". The Indian Express. 26 May 2014. Retrieved 3 February 2016. ↑ "My memorable School days at St. Xaviers". Arun Jaitley. Archived from the original on 12 February 2013. Retrieved 17 February 2013. ↑ "Member Profile: Arun Jeitley". Rajya Sabha. Retrieved 17 February 2013. 1 2 "Shri Arun Jaitley, Honb'le Minister of Law, Justice and Company Affairs, Shipping, Bharatiya Janata Party". Press Information Bureau, Government of India. 1999. Archived from the original on 24 July 2009. Retrieved 24 October 2008. ↑ "Cometh The Hour..." Outlook . Retrieved 3 June 2014. ↑ Singh, Justice Manmohan. "Mr. Arun Jaitley vs Network Solutions Private Limited". Delhi High Court . Retrieved 6 May 2013. 1 2 "Sorry". The Indian Express. Retrieved 25 October 2012. 1 2 3 4 Khandelwal, Avani (10 July 2014). "Who is Arun Jaitley: The rise of India's newest finance minister". Daily News and Analysis . Retrieved 6 September 2014. ↑ "List of Senior Advocates designated by Delhi High Court upto August, 2014" (PDF). Delhi High Court. Retrieved 6 September 2014. ↑ "SC stays contempt proceedings against Coke, Pepsi,". The Economic Times. ↑ "SC imposes Rs 1 cr cost on firms for defacing rocks". The Times of India. ↑ "Court blow to cola giants". The Telegraph1. Calcutta. 5 November 2004. ↑ "Arun Jaitley recuses himself from decisions on Vodafone tax case". Business Today. PTI. 19 June 2014. Retrieved 6 September 2014. ↑ "Rajya Sabha Members Homepage – Arun Jaitley". Rajya Sabha. Retrieved 5 May 2013. ↑ "Central Election Committee". BJP. Retrieved 6 May 2013. ↑ Manoj C G (27 July 2015). "View from the Earlier Side: When Jaitley saw 'benefits to the country' in obstructing Parliament". Indian Express. ↑ "'Disrupting Parliament is important': BJP's words from opposition days come back to haunt it". Scroll.in. 24 December 2014. ↑ "Narendra Modi government: Full list of portfolios and ministers". The Indian Express. 27 May 2014. ↑ "Corporate Affairs Ministry to be 'clubbed' with Finance Ministry". The Economic Times. 27 May 2014. ↑ Raghuvanshi, Vivek (7 September 2014). "Analysts: New Modi Government Lacks Clear Defense Policy". Defense News . Retrieved 7 September 2014. ↑ "WikiLeaks cable on Arun Jaitley's 'opportunistic' remark". NDTV. 26 March 2011. Retrieved 3 February 2016. ↑ "Arun Jaitley denies remark in WikiLeaks cable". NDTV. 26 March 2011. Retrieved 3 February 2016. ↑ "Bihar polls: Grand Alliance's idea of reservations on the basis of religion is fraught with danger, says FM Arun Jaitley". ↑ "All those who are involved in the traditional caste psyche will suffer a big setback: FM Arun Jaitley". ↑ "Arun Jaitley appointed to Board of Governors of Asian Development Bank". Biharprabha News. Indo-Asian News Service. Retrieved 2 June 2014. ↑ "Will be switching to GST regulation from June 30 midnight: FM Arun Jaitley". The Economic Times. 2017-06-20. Retrieved 2017-06-20. ↑ "CEO Brief: India" (PDF). New York: Out Leadership. June 8, 2017. ↑ Chatterjee, Ashok (24 April 2004). "Knot for everybody's eyes". The Times of India. Archived from the original on 23 January 2019. Retrieved 25 October 2012. ↑ "Profiles of Rajya Sabha Members (needs selection)". Rajya Sabha. Retrieved 6 September 2014. ↑ "Arun Jaitley's daughter Sonali gets married". The Indian Express. 2015-12-08. Archived from the original on 23 January 2019. Retrieved 2019-01-23. ↑ "An eyewitness to history: We were a Partition family, says Arun Jaitley". Hindustan Times . 28 May 2016. Retrieved 28 May 2016. ↑ "Indian FM Arun Jaitley diagnosed with rare cancer". Khaleej Times. 17 January 2019. Retrieved 17 January 2019.